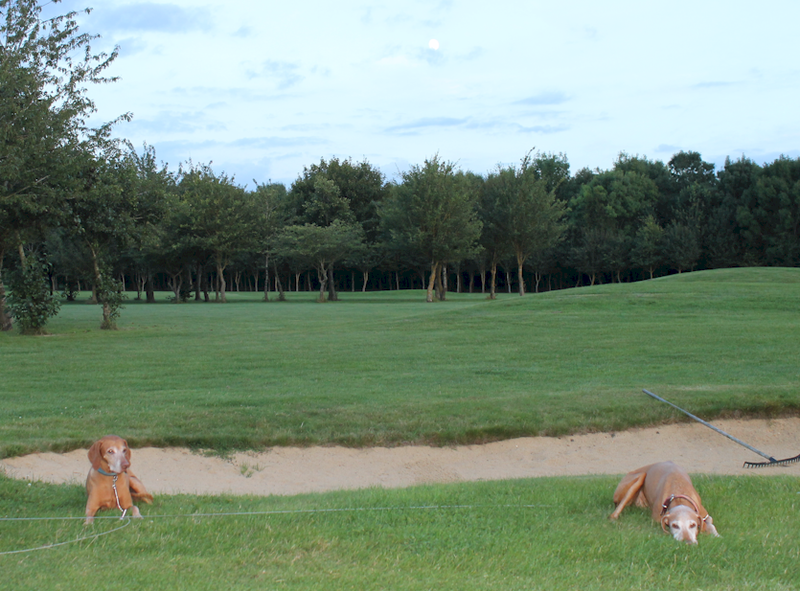 Waterstock Golf Club might not put the stock in the water, but it certainly does put the legs in the dog legs. Five of the holes have some sort of dog-leg and holes 4 and 10 are virtually perpendicular. 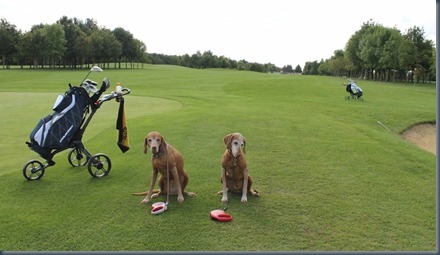 Welcome: The pro shop manager was very amiable when we mentioned our dogs. He said that 8-20 members bring their dogs. 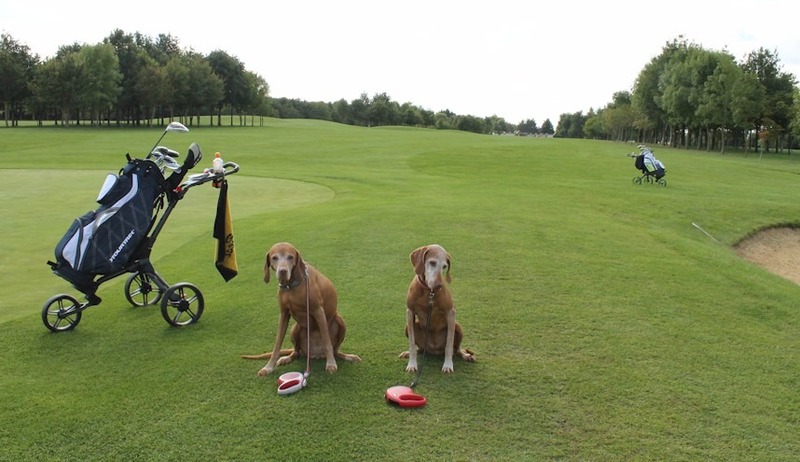 He said that one member comes every Thursday with his dog, the dog picks a ball out of the lake-balls basket in the shop at the start of the round, carries it around with him during the entire round and then deposits it back in the basket at the end of the round. He also told an amusing tale of playing a links course (Scotland is notoriously dog-friendly in golf) when he saw out of the corner of his eye a trolley scudding along the fairway being pulled by a dog attached to it like some sort of Alaskan sled dog who had obviously gotten inspired for a bit of a run despite his owner’s attempt at anchoring his lead. Walk: Like most of the courses on the Oxford Plain, hills are the least of your worries with hardly an incline to tackle. It was a fairly conventional 6500 yards, but its openness makes it seem bigger. Water: Its name notwithstanding, there is not actually any water on the course. No spigots and no water hazards (though there is a little lake between the driving range and Hole10, you never come close to it). Fortunately, the bar manager was very gracious and brought out fresh cold water from the bar when we made our pit stop there after the 9th hole. Wind Down: With the days getting shorter, we were fighting daylight a bit. But at least we were blessed with a lovely moon rise over our last few holes. 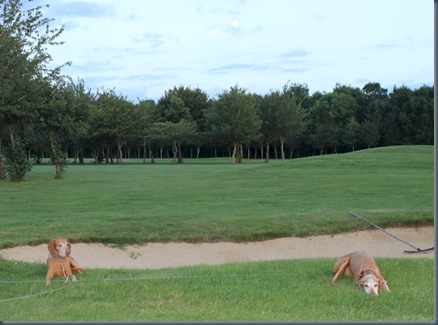 Instead of the caricature of howling, Rusty and Grace decided that was their cue for a bit of a lie down on the penultimate hole (see photo below). We packed up and went over to The James Figg in Thame (about 4 miles from the course). Some of the tastier food we have had at a dog-friendly pub (I had the pulled pork sandwich and Lori the chicken Caesar salad). But they do put the “friendly” into dog-friendly. We arrived a smidgeon past the 8:30 pm kitchen closing, but the manager went back to re-open it for us. Dogs are welcome in the entire pub (dining tables and bar area including an outdoor seating area out back) and just about all the patrons made a fuss over Rusty and Grace to their delight.